I'm in a great mood today! It's Friday, for one thing. And secondly, tomorrow is my birthday! And thirdly, the weather is finally warming up in London. By warming I mean highs of 21 C, but I'm not complaining! I'll take this over rain any day. Anyways I am really happy about something else too. After trying endless ones over the years, I think I have finally found the perfect moisturizer for my face. I have seriously oily skin and I've tried many many moisturizers which claim to mattify the skin and reduce oil production. 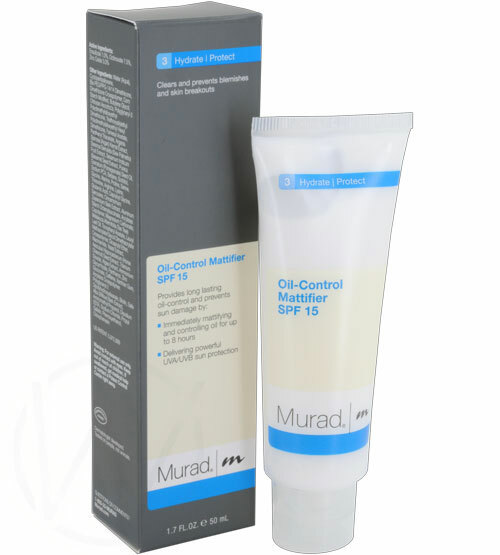 None have worked quite as well as the Murad Oil-Control Mattifier from their 'Acne & Blemish Control' line. I've been using it for about a week now, and I'm convinced that it works as it says. Usually 4-5 hours into the day I start to get a sheen on my face which only goes away once I powder my face. While I've been using Murad I haven't had to use any powder at all, except the little bit I put on in the morning as part of my makeup routine. If you happen to go to a Murad counter, they have this cool skin evaluation system which takes a very complex 'photograph' of you skin and evaluates its main concerns. Then the consultant tells you which skincare line would be best. A bit gimmicky but it was interesting and its free! Another bonus is that it has SPF 15 which is an essential component of any good facial moisturizer. The texture of the cream is quite thick, but it blends into the skin very quickly and you don't really need a lot. It's not oily like other moisturizers and gets absorbed into the skin right away. One of the main ingredients is Willow Bark Extract which is great as a skin exfoliate. It removes dead skin cells and keeps your pores clear so your skin looks extremely smooth.The only down side is the cost; £37 for 50 ml. I think it can be found for slightly cheaper on some online beauty stores like Feel Unique. Also, another alternative is to get it from the US if you happen to be travelling there as it is far cheaper there. But it works so well that I'm going to keep using it. I might consider trying out something else from the range as well but for now this is working great!